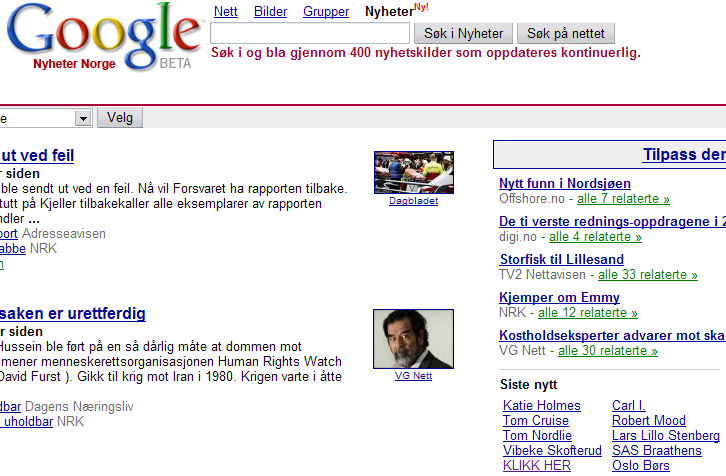 Google released a Norwegian version of Google News last week. Several organizations here in Norway are concerned about copyright violations. The two major newspapers, Dagbladet and VG, on the other hand welcomes Google and states that consumers want a complete product, not just a automated collection of stories as with Google News. Automated it is indeed. As the following illustration shows. The top stories section of Google News displays 'KLIKK HER' which in English translates to 'CLICK HERE'. 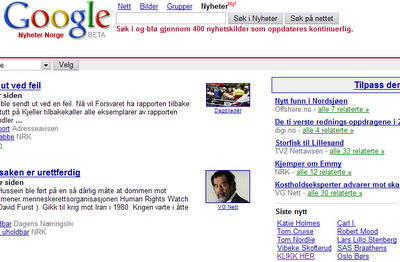 Not only a weakness in Google News but I guess Norwegian news-sites don't know the importance of anchor text. Written on 20 November 2006.